La Farola Cafe is a Spanish bistro located at Upper Street in London. We had brunch there on one of the days while we were in London during our Trip of a Lifetime. To get here, we traveled to Angel Station (via London Underground). At the street level, we walked north along the street for about 5 minutes to get to La Farola, which is located at the junction of Upper Street and Theberton Street. 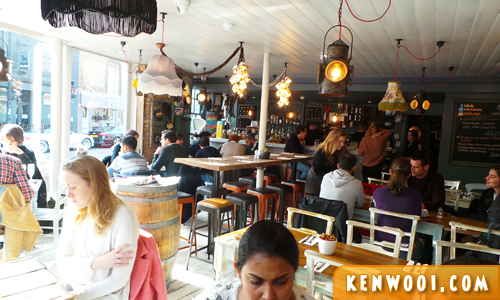 It’s like any other modern cafe – simple and hipsterish. 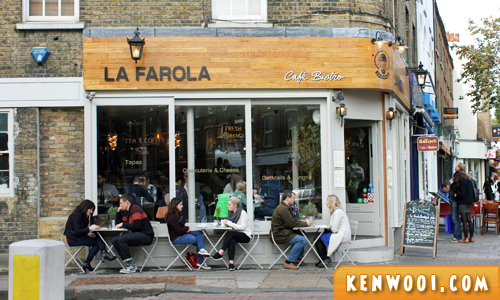 Now, you may already know that I don’t travel for food – so how did we end up discovering La Farola? 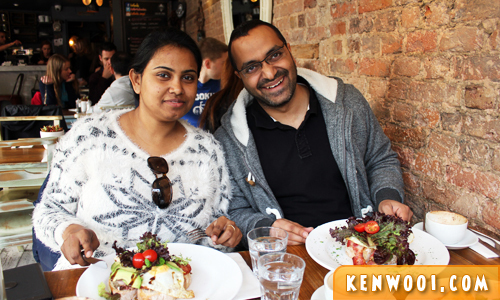 Well, during our recent Europe Taster Tour by Expat Explore, we made friends with a couple, Rakesh and Dash, who’s working in London. After the tour, we exchanged numbers and went our separate ways. But since we had the remaining 5 days to explore London (before we flew back to Malaysia), Dash asked us out. 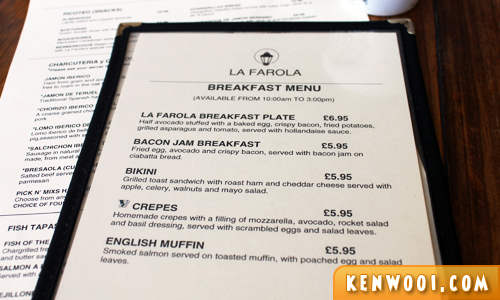 Besides the Spanish food selection, La Farola has a Breakfast Menu available from 10am to 3pm. Shane and I ordered the “Bikini” and “Bacon Jam Breakfast” respectively. Both order costs £5.95 (RM39). Here’s the Bacon Jam Breakfast. 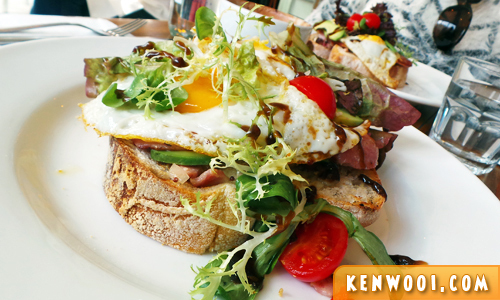 It’s ciabatta bread topped with fried egg, avocado, bacon and salad. Pretty simple dish to kick-start the day. Here’s the Bikini, Shane’s order. 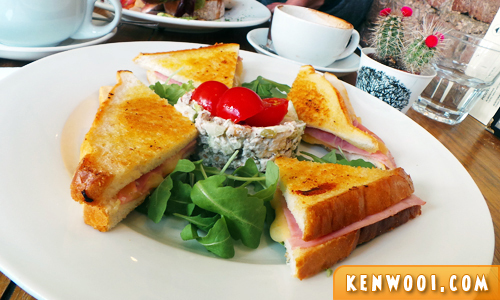 It’s grilled toast sandwich with roast ham and cheddar cheese, served with apple, celery, walnuts and mayo salad. 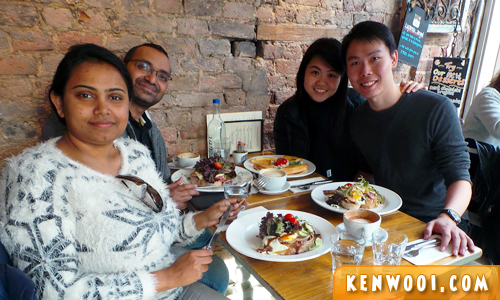 Anyway, besides the food, we had a good time exchanging thoughts about the Europe Taster Tour by Expat Explore, the memorable experiences, and our respective lives in London and Kuala Lumpur. After the meal, they brought us for a quick walking tour to St. Paul’s Cathedral and Millennium Bridge, a bridge for pedestrians. Well, this meet-up definitely wasn’t part of the initial plan, but we are glad to have known Rakesh and Dash along the way.